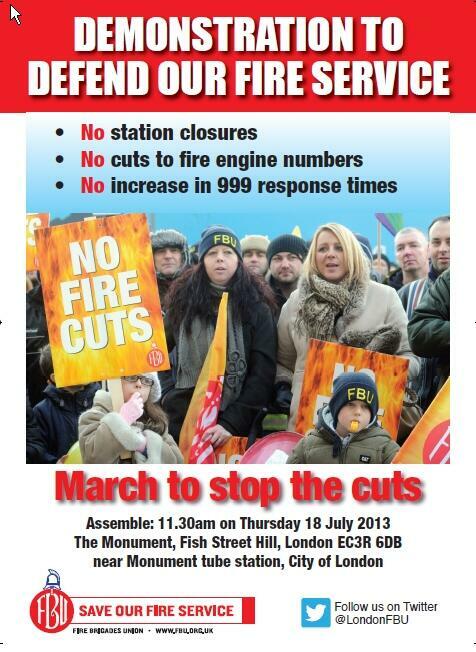 Meet at The Monument, London, 11.30am on Thursday 18 July. As our thoughts are with the family and colleagues of firefighter Stephen Hunt who died while tackling a blaze in Manchester on Saturday 13 July, show solidarity by planning to support London FBU in their campaign against fire service cuts. 10 firestations, 14 fire engines, 552 frontline firefighters and 2 specialist fire and rescue units will be cut if Mayor Johnson gets his way. 94% of Londoners opposed these cuts in the public consultation. Add your voice to theirs this Thursday. The Monument is only 10 minutes walk from London Bridge railway station – being the historic, gold-capped tower at the north end of London Bridge. So easy to get to from Sussex, we’ll see you there. Brighton, Hove and District Labour Party has unanimously passed the motion below. We recommend that others also adopt it. This Labour Party opposes the cuts to the London Fire Brigade being forced through by Mayor Boris Johnson and resolves to actively and publicly support the London FBU and the London Labour Party in their campaigns against these dangerous cuts as this may be a fore-runner to cuts in other parts of the country, including the proposed cuts in East Sussex. This Labour Party also opposes the proposal by Coalition Fire Minister Brandon Lewis to privatise national Fire and Rescue Services. This Labour Party resolves to actively and publicly support the Fire Brigades Union (FBU) in its campaign opposing the privatisation of the Fire Service or any part thereof.